A little while ago, we decided we would climb a mountain in every country we visit. 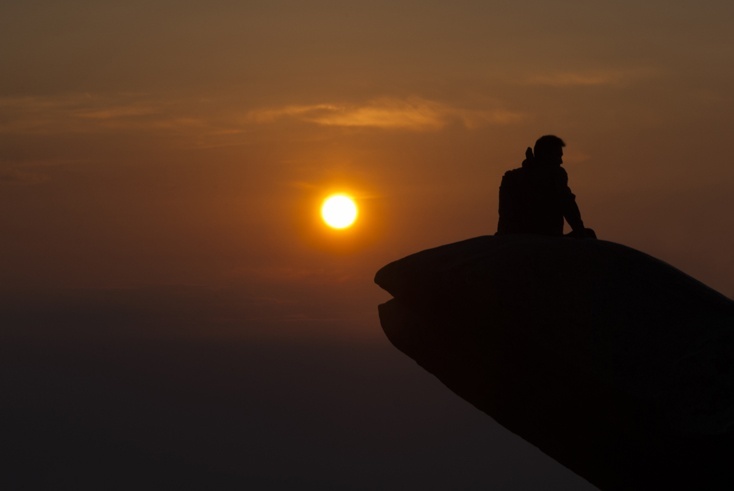 In China, we chose Mount Tai (Tai Shan), the most climbed mountain in the country. 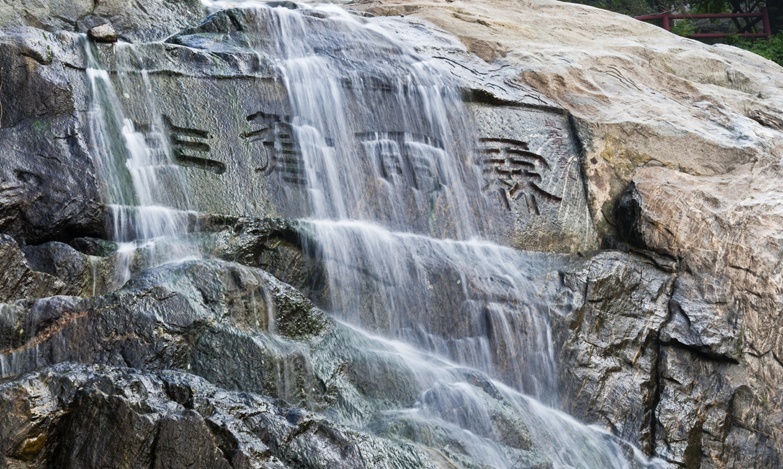 Here’s our practical guide to help you plan your Mount Tai adventure. 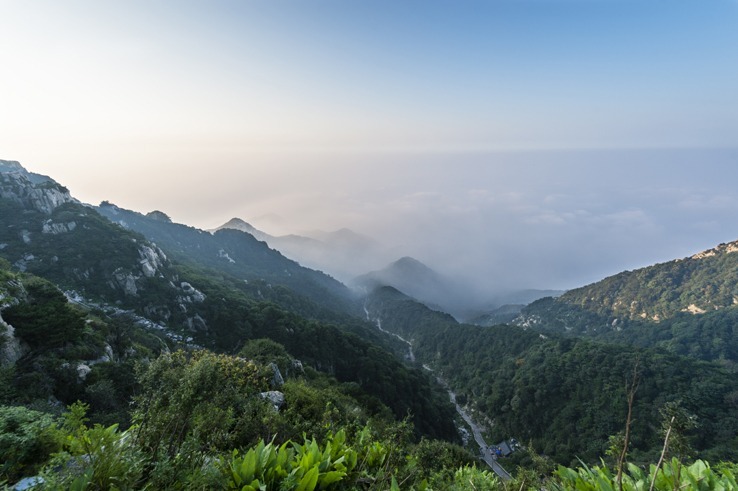 Mount Tai is the greatest of the Five Great Mountains, the most famous mountains in Chinese history, destination of imperial pilgrimages and sacrifices for over three thousand years. 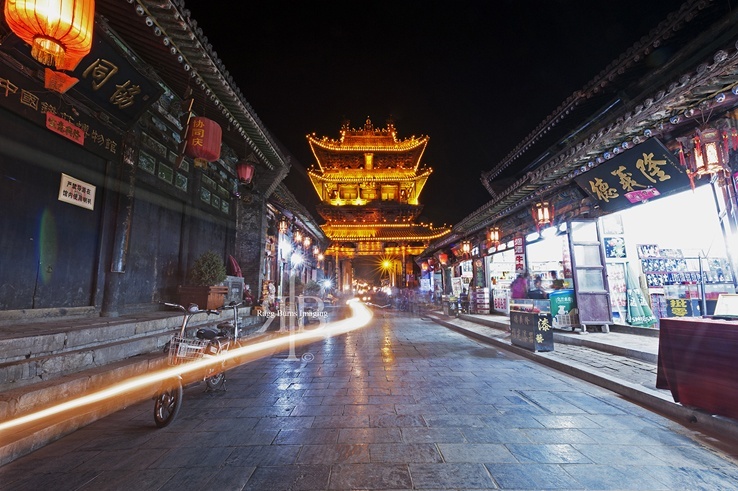 Their religious significance transcends faith; they have been associated with Confucianism and Buddhism, but their strongest relation is with Taoism. Each of the Five Great Mountains is related to one of the five cardinal directions. Mount Tai is the mountain of the East; it is associated with birth, sunrise and renewal. The first emperor of China, Qin Shi Huang (of Terracotta Warriors fame) announced the unity of China from the summit of Mount Tai, two hundred years before the birth of Christ. 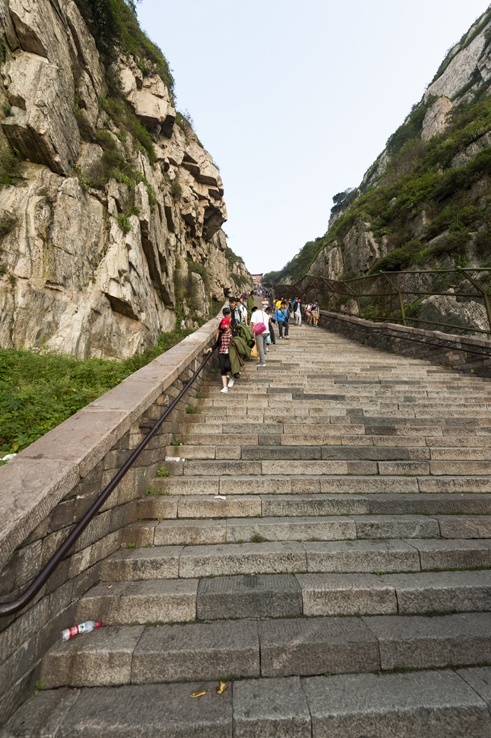 Nowadays, Mount Tai is a UNESCO World Heritage site, visited by six million people every year. 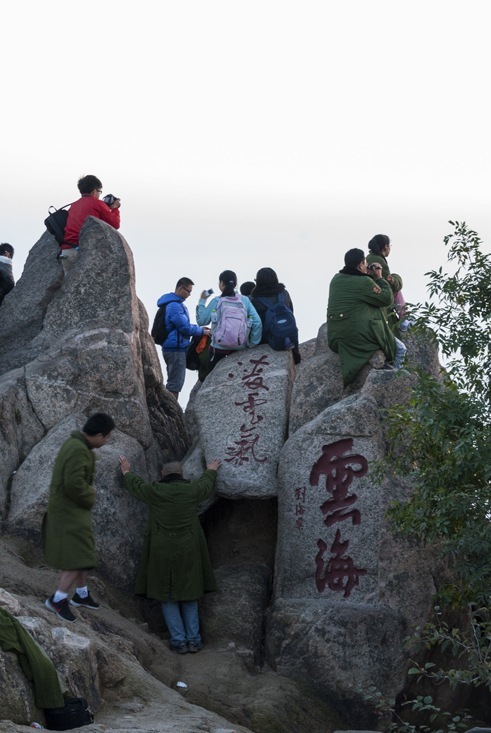 There are dozens of temples, stone tablets and inscriptions lining the path to the summit, making the mountain a cultural as well as natural attraction. 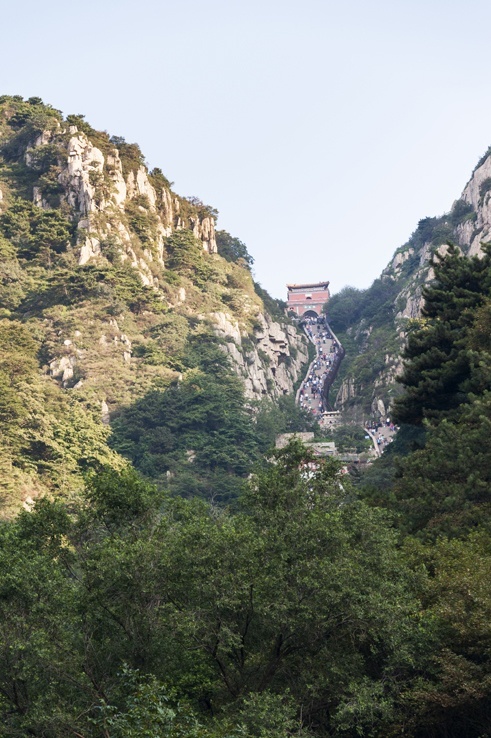 The gateway for climbing Mount Tai is the city of Tai’an, roughly half way between Beijing and Shanghai, making Mount Tai an ideal stop between the two cities. Bus number 3 takes you from the city to the trailhead, from where it’s a short walk to the ticket office. 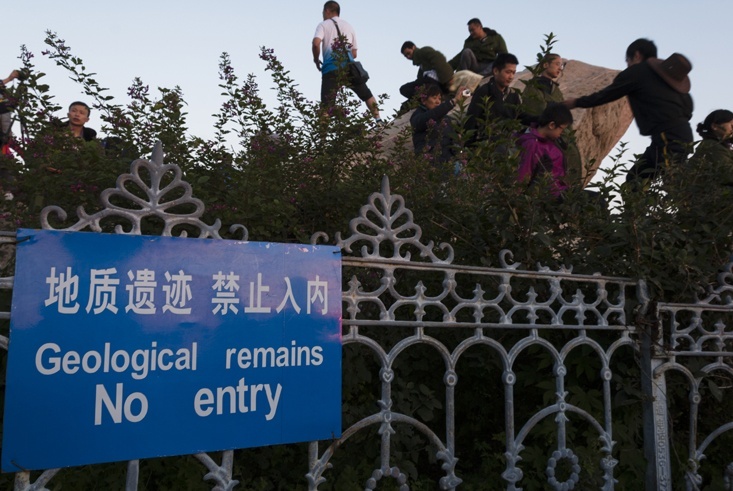 Entry to Mount Tai is ¥125 (¥62 for students with valid ID). Alternatively, it’s possible to walk to the entrance from the town centre in about 20 minutes. It’s easy to find the way, just walk uphill. 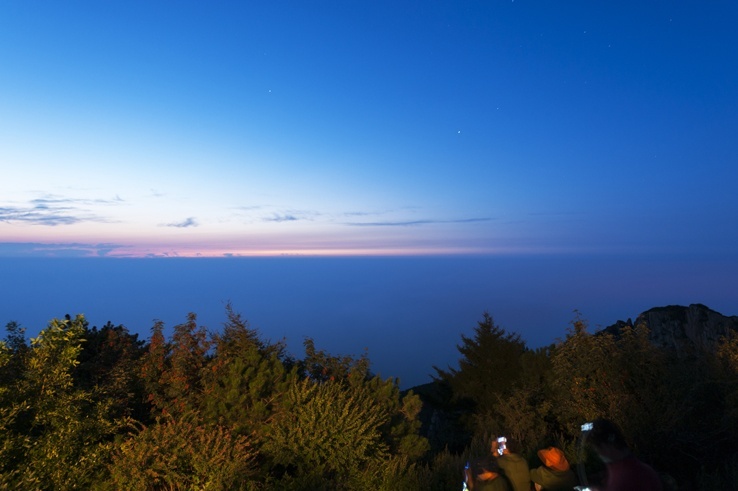 As Mount Tai is associated to sunrise in Chinese lore, so the climb is traditionally made at night, to view the sunrise from the top. No climbing or hiking experience is required; it is a strenuous walk over a paved path with 6666 steps climbing for 1400 meters from entrance to summit. Guides are not necessary as the path is extremely easy to follow, but may be useful to illustrate the significance of temples and stone inscriptions. 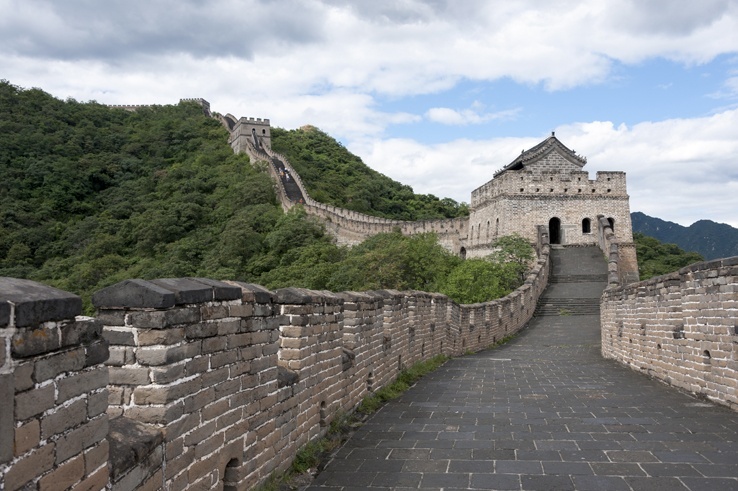 The steps are incredibly steep at times, such as in the section leading up to the South Gate to Heaven, that looks almost vertical from a distance. 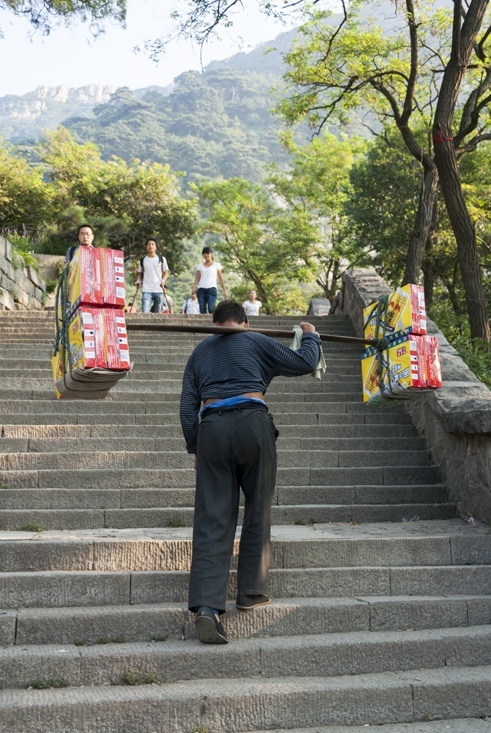 People of all ages climb Mount Tai, but it’s also possible to take a bus to the halfway point and a cable car to the summit. Climbing to the halfway point (Midway Gate to Heaven) takes about 2 hours, and another two (tough!) hours to the South Gate to Heaven. Contrary to what it seems from the trail, the South Gate to heaven is NOT the summit. 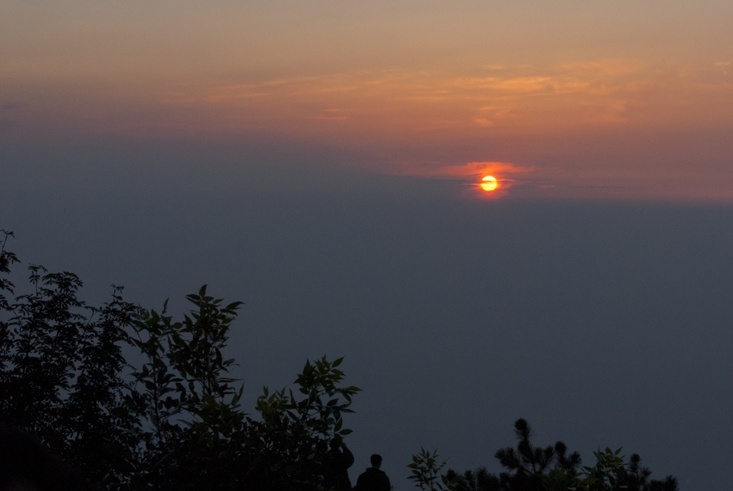 From there, it’s another hour to the Jade Emperor temple, the highest point and prime sunrise spot. Climbing at night is a boring affair, in almost total darkness (don’t forget a headlamp! ), meaning there are no views and temples are closed for visitors. An alternative is sightseeing on the way down, but chances are you’ll be so tired after the long climb up and suffering from jelly legs that you’ll be rushing to your bed. It’s also possible to walk up during the day and spend the night near the top. Hotels charge extortionate prices for below-average accommodation, but they often offer discounts of 50% or more just by asking. There are also tents near the South Gate to Heaven, charging ¥200 for a 2 person tent. You can buy water and snacks on the way. Of course, they’re more expensive than in town. Prices rise considerably around the Midway Gate to Heaven, then stay about the same all the way up. Drinks are expensive at the top? That’s why. The difference in elevation from bottom to top is 1400 meters, meaning that it’s likely to be chilly and windy around the South Gate to Heaven and the summit. If you haven’t got warm clothes, it’s possible to rent Chinese Army coats for ¥20. If you start at 11pm, you’ll reach the South Gate to Heaven around 3am, about 2 hours before sunrise. If you want some shelter from the cold, there’s a tea shop where you can sit and have a drink for about the same price as a Chinese Army coat rental. 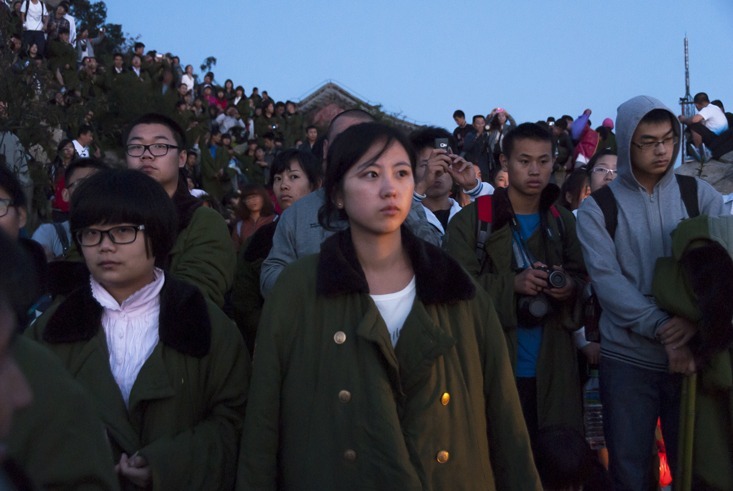 Don’t expect to be alone on the summit – Mount Tai is VERY popular with Chinese tourists. If you’re after a romantic sunrise, this isn’t the place for you. It’s still a worthwhile experience though. The climb up is a real challenge, but seeing the sun rise from a sea of clouds at the top and taking in the wonderful views on the way up (if you climb by day) or down (if you climb at night) makes up for the jelly legs and sore knees. What an epic journey. Even the crowds don’t seem to take away from the views and the experience. I have yet to really explore China but love the description and tips for climbing Mt Tai. 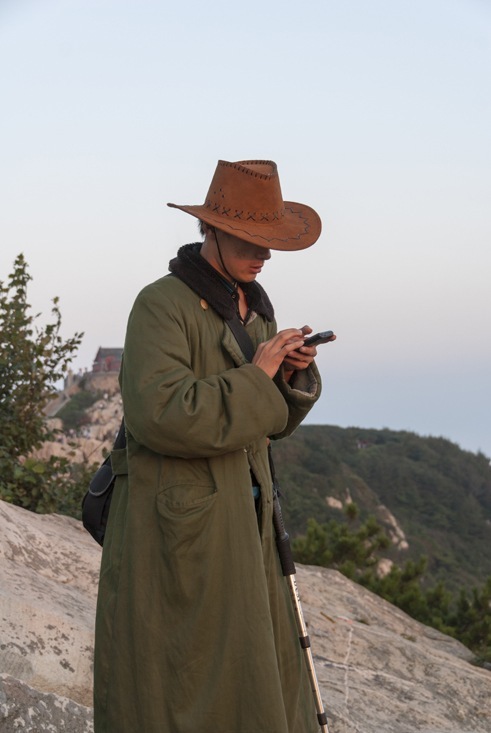 Some of the photos you posted are awesome and I would definitely be all over hiring a Chinese army coat. It reminded me of an experience I had years ago climbing Mt Merapi in Java at night. The result was a frozen me and a gorgeous sunrise. Sometimes, like you say, the pay off is well worth the few hours of suffering. There’s something to be said for a mountain you can climb in one day. After Kili, this sounds doable for us as we are not up for anything too strenuous again for quite a while. I can’t believe there is so much stuff you can buy on the way up! These are some great shots. I’ve only done this once (climbed a mountain in Nepal over 15 years ago). Our two days climbing culminated with the summit just before sunrise. Have to put this one on our list. Wow that is a crazy climb but I bet it is worth it for the views. And I would totally rent one of those lovely coats! haha Great post – looks amazing!! 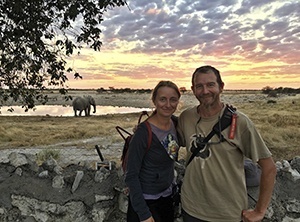 Great photos and guide! I think it is a fantastic idea to climb a mountain in every country you visit. The number 6,666 really stands out to me. Any idea why? Was this on purpose? If I recall, I think 6 is considered a lucky number in China. I wonder if it also has some correlation with the fact that there are 9,999 rooms in the Forbidden City. Interesting to ponder. I am very impressed by your goal of climbing a mountain in each country that you visited. If I was going to climb one, easy to follow stairs up would be the way I would want to do it. That view is beautiful, and I can see why so many of the Chinese tourists do it. I love that you have a goal to climb mountains in countries you visit. Mount Tai looks so imposing and that climb just sounds intimidating with the steepness and the crowds. That sunrise view and the overall experience looks like it was all worth it though. This is one crazy climb! I would do it without even thinking about it! I’ve heard of Tai Shan before, and I would love to climb it someday. I can only imagine how magical it must be to see the sunrise above the clouds! 6666 steps… yikes! I think how it’s kinda funny how mountain climbing in China is basically just if you have the endurance to walk up a ton of steps (I’ve done a couple of other mountains in China). I remember seeing people who manually carried up food and supplies on poles up the steps. It made me feel really bad. Fab tips! I would be getting that coat and rocking out in it for sure. 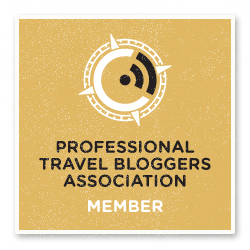 Big thanks for linking up with us for #SundayTraveler again.